For mac aficionados there is something more important than Christmas and that is Macworld San Francisco in January. The rumor mills are running rampant on predictions for this macworld with intel iBooks topping the list of predictions but I am wishing for some other things from Apple. What I would call the trojan macs. The second machine I would like to see apple release, I even hesitate to call a mac, would be a hybrid of an ibook and the Nokia 770. Think of it as a ibook with the keyboard replaced by a touch screen and a added infrared port. It should be marketed primarily as a kind of ebook/web reader/itunes controler but again in reality there is a mac under the hood. The nice thing with both these machines are that they are not primarily macs and therefore can be marketed more like appliances negating a lot of the windows arguments nor will they require all the third party software to be ported to Intel on day one. But they will both put OSX in the hands of a lot of people, expanding the OSX user base in a trojan way. Parody the sincerest form of flattery? Frederik Samuel noticed something strange with these two ads. What is TBWA trying to do here? It's not a spoof becuase a Golf is hardly in the same class as the 300Z. Everything is the same except that this time the cops are protecting the car except being protected by it. 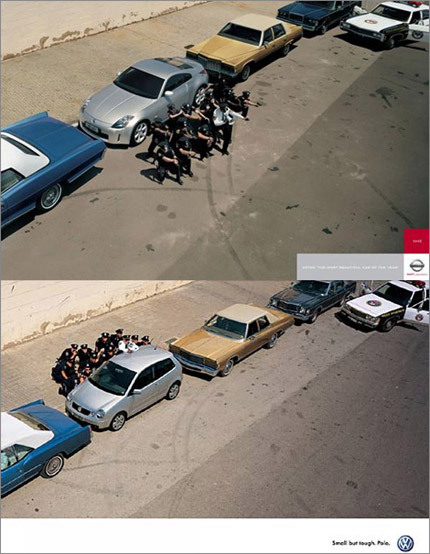 Parody is great when you know what is being parodied and that is what makes this TBWA Nissan parody of the VW ad so strange, nobody outside the advertising world will ever understand the joke on the polo ad but still they have gone through a lot of expense to almost clone the Polo ad, if you look carefully you will notice the cars are very similar but not the same, the location is exactly the same or is the sidewalk and wall just photoshoped back in? In any case it seems like a lot of expense for a parody that very few will ever understand. Now the strange thing is that there are a bunch of other copies of the Polo ad.